Extend an audio cable with 3.5 mm stereor connectors to 6 ft. This cable extends the cable on your microphone or other audio device by 6 feet. 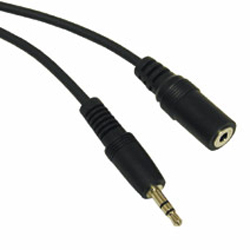 It has a standard 3.5 mm (1/8 inch) stereo male plug on one end and a corresponding female jack on the other end. We get this cable from a variety of sources. Most come from China.